Long Island is home to many innovation hubs including Hofstra University, Stony Brook University, Farmingdale State College, Cold Spring Harbor Research Laboratory, and Brookhaven National Laboratory. An extensive amount of R&D is being performed at these centers for purposes of scientific advancements in multiple industries. Federal and state research and development tax credits are available to help shoulder the costs of these innovation efforts. Located on the Farmingdale State College campus and in a NYS tax-free zone, the Broad Hollow Bioscience Park is designed to support the development of biotech startups requiring lab space. With over 100,000 square feet in two facilities, the BHBP provides wet lab space, resources from the Farmingdale campus, and partnerships with surrounding businesses and research institutions with affordable lease rates. One Bioscience Park Drive boasts 62,000 square foot of biology, chemistry, instrumentation and automation, pilot production, and administrative spaces. Three Bioscience Park Drive is a 40,500 square foot facility with vivarium, general R&D, office and support spaces. Start-ups located inside the BHBP will also have the advantage of utilizing Farmingdale’s Bioscience Program students. The Cold Spring Harbor Laboratory (CSHL) has shaped contemporary biomedical research and education in the fields of cancer, genomics, neuroscience, plant biology, and quantitative biology. Thomson Reuters ranks CSHL number one in the world for the impact its molecular biology and genetics research has had. “The introduction of mathematical methods into biology is without question going to revolutionize it just as it did revolutionize physics in the days of Isaac Newton” commented mathematician and hedge-fund founder James Simons on his recent $50 million donation to the Cold Spring Harbor Laboratory. The gift aimed at enlarging and institutionalizing the Simons Center for Quantitative Biology, an interdisciplinary cooperation among mathematicians, physicists, engineers, biologists, and computer scientists whose research focuses on population genetics, genetic disorders and diseases, as well as disorders like cancer, autism, and depression. Brookhaven National Laboratory (BNL) focuses their research and development efforts on energy security, photon sciences, QCD matter, physics, and climate, environment, and biosciences. The over 3,000 scientists, engineers, and support staff, at BNL are joined by over 4,000 visiting researchers from around the world to collaborate on novel discoveries from nanoscale to cosmic scale. Mostly funded by the U.S. DOE Office of Science, Brookhaven National Laboratory has won numerous awards including a 2014 R&D 100 award – or “Oscars of Innovation” - for their GammaScout radiation detector system. The system provides detailed spectroscopic and imaging information about x-ray and gamma-ray radiation. 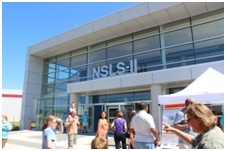 In 2014, Brookhaven National Lab completed construction of their state-of-the-art, billion dollar National Synchrotron Light Source II (NSLS-II). 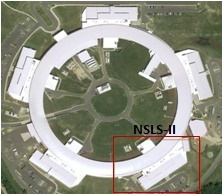 The NSLS-II is designed to provide an array of 60 separate beamlines with x-ray, ultraviolet, and infrared light stations available for wide range of commercial, government, and university project end users. These focused x-rays greatly advance materials science by enabling scientists to view matter at the molecular level. The potential applications are almost limitless and include metals, electronics (including semiconductors and crystals), chemicals, structural biology, environmental substances, batteries and a myriad of other materials. BNL offers end users complimentary utilization of the beams as long as the end user is willing to engage in an agreed level of information sharing. Beam usage is approved and allocated after steering committee review. As of mid-2015, the beam has been approved for use by six end users. This shared use of the NSLS-II asset is one of the most novel and important examples of the sharing economy. In this case, a billion dollar asset is being shared at no charge for the advancement of science. Stony Brook University is just one of the institutions at the forefront of Long Island innovation. At the university’s Center for Excellence in Wireless and Information Technology (CEWIT), groundbreaking research is performed in a multitude of industries including robotics, hybrid and wireless networks, cyber security , RF systems, sensor networks , genetics and protein computation, neurobiology, and virtual reality . For example, using computed tomography (CT), the center has developed a virtual colonoscopy which uses x-rays to record cross sectional, 2D images of the body’s interior. The virtual colonoscopy outperforms traditional optical colonoscopies in multiple ways. Stony Brook University received a $1.4 million grant from the National Science Foundation to build the Reality Deck, a unique tiled display that immerses users in 1.25 billion pixels of information to provide a life-like, realistic experience. In addition, the Reality Deck provides incredibly detailed viewing capabilities for scans from Stony Brook Medical Center’s new 320 slice CT scanner. Reality Deck can also be used in the rapid diagnosis of acute chest pain for patients. Stony Brook University has also developed ‘Lydia’, a natural language processing (NPL) system for the large-scale analysis of news. The Lydia text analytics system that builds relational models of people, places, and things through news, blog and other web source information. With over $160 million in industry commitments, 40 U.S. patents, and numerous startup companies, Stony Brook University’s CEWIT is a great example of the growing presence of innovation on the island. Pediatric Multiple Sclerosis: One of six programs in the nation that has been designated as a Center of Excellence by the National Multiple Sclerosis Society. Over 400 children have been evaluated since its inception. Spine: Spine surgeons at Stony Brook offer the latest surgical advances, such as alternative approaches to spine fusion surgery using bone morphogenetic proteins, a bone growth substance that avoids the need for painful hip bone grafts. Neuro-Oncology: Physicians at the university perform stereotactic radiosurgery (SRS), a non invasive procedure that allows for pin point precision of an area of the body such as a brain tumor. Applied DNA Sciences: Using biotechnology, Applied DNA Sciences delivers unique security solutions for supply chain protection, brand authentication/protection, and law enforcement applications. Goddard Labs: The biotechnology company, Goddard Labs, focuses on the development of molecular diagnostics for agricultural and environmental improvements. Goddard’s R&D efforts are aimed towards developing solutions for microbial pathogens and other foodborne outbreaks. Conlida Labs: Research and development activities at Conlida Labs are focused on the cosmetics and pharmaceutical industry. Products in development include cosmeceuticals, hair care, and personal care products with a special focus on eye care. The LIHTI is a non-profit business incubator that helps grow and support new, technologically innovative companies in the early stages. The LIHTI’s affiliation with Stony Brook University and the medical center creates an ideal environment for novel R&D activity. LIHTI has graduated over 70 businesses and 44 companies from its program. Among these are IntelliCheck, Apex Scientific Inc, Chroma Research Labs, Inc, MetaStat, Inc, NewYorkBIO, Softheon, and Brookhaven Technology Group. With the recent addition of both a school of engineering and a school of medicine, Hofstra University became the third NYS school, along with Columbia and NYU, to have law, engineering, and medical programs. School of Engineering and Applied Science: Hofstra’s new School of Engineering and Applied Science expands on the Engineering and Computer Science department in an effort to increase focus on high-tech research, practical work experience, and interdisciplinary study. The university has invested over $7.5 million in facility upgrades and with funding from the Empire State Development Corporation, also built a new, $1 million biomedical engineering lab. School of Medicine: Hofstra’s School of Medicine is the first allopathic medical school in almost 40 years The Hofstra and North Shore LIJ partnership allows hundreds of physicians, scholars, administrators, and leaders to participate in cutting edge and scientifically rigorous curriculum at the school. The medical school’s research includes numerous life science fields such as Leukemia where research studies are aimed at increasing the cure rate of the disease through chemotherapy research. In addition to life science, defense contracting also plays a large role in Long Island innovation. Telephonics Corporation: Based in Huntington, Long Island, Telephonics is a world leader in fully integrated, advance sensor, and communication systems technology for the aerospace, defense, and commercial markets. Telephonics R&D activities include a focus on radar systems and the company is the world leader in airborne radar and IFF systems enabling helicopter, fixed-wing aircraft, unmanned aerial vehicle, shipboard and ground based systems missions in more than 25 countries. In 2014, Telephonics was awarded a $13.2 million in contract for work on the U.S. Air Force’s Enhanced Mode Radar, Enhancement Mode 5 Radar, and the procurement of log lead material related to these systems. Work under this contract will continue through November 2017. CPI Aero Inc.: Based in Edgewood, NY, CPI Aero is growing its Long Island presence. The company’s new 171,000 square foot facility houses over 160 workers and is poised to continue expanding. R&D efforts are focused on aerospace assemblies for a variety of commercial and defense clients. In March 2015, CPI was awarded a contract – valued at $6.75 million - by Northrop Grumman for an airborne laser mine detection system. Long Island is continuously growing as a national center for innovation with millions of dollars put towards technological advancements in multiple disciplines. Long Island companies performing research and development activities should be aware of the state and federal R&D tax credits available to shoulder these research costs.